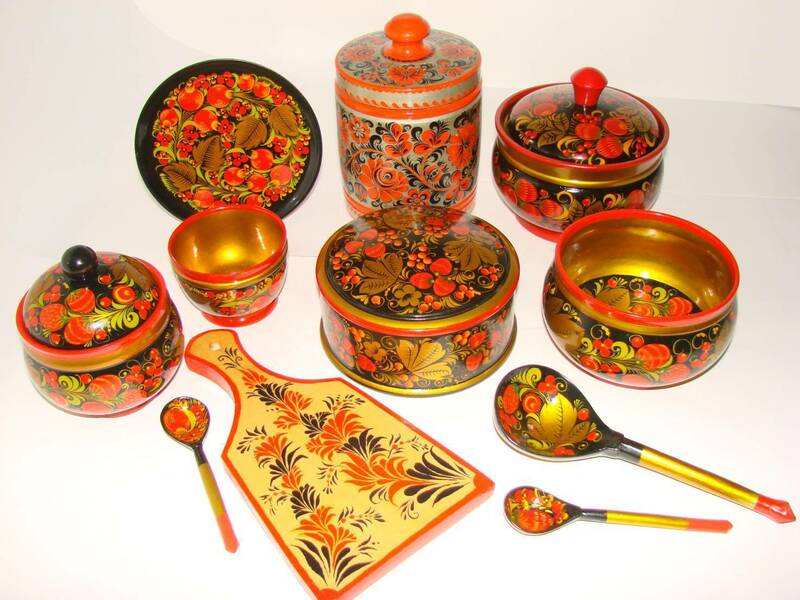 Moscow offers a wide choice of unique souvenirs, especially in Arbat Street and at the Izmailovo Vernissage Market. 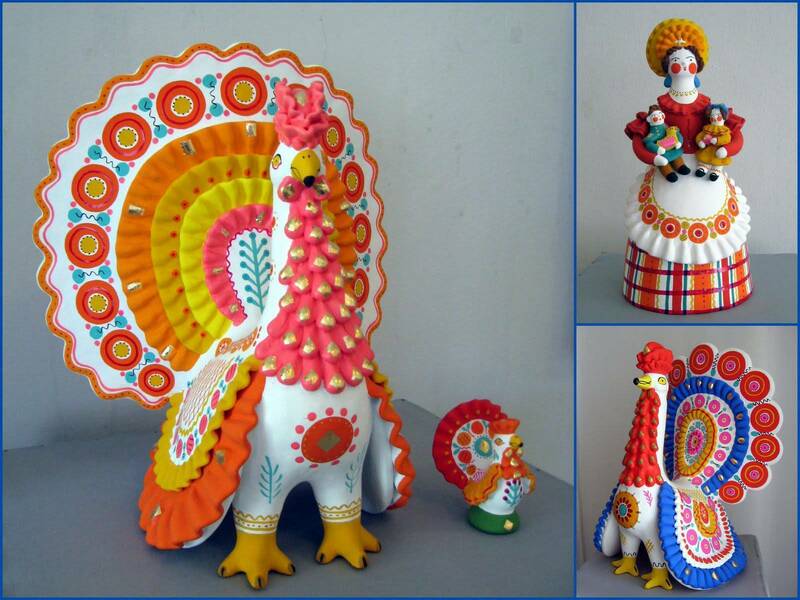 Russian folk art brands such as Gzhel, Khokhloma, Dymkovo and others are among the greatest souvenirs to bring home from Russia. 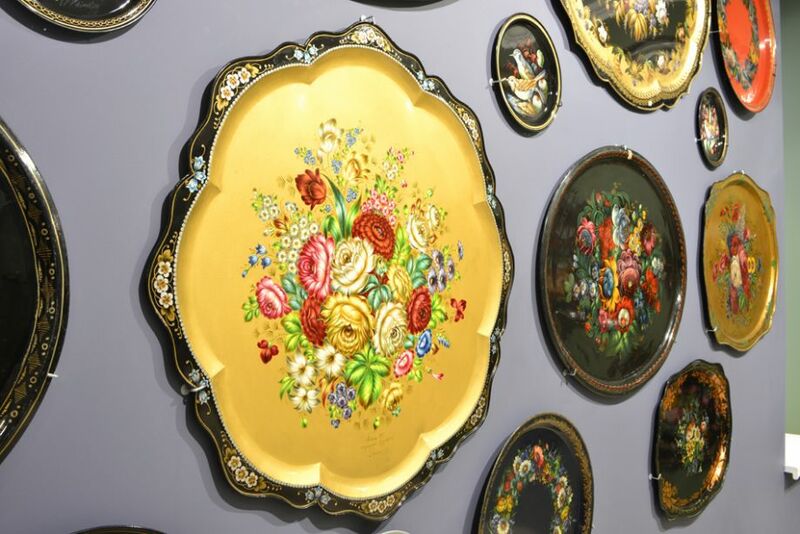 Visitors can buy antiques in salons and art galleries (subject to customs clearance). 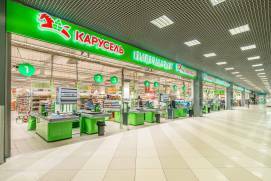 Enjoy duty free shopping at Moscow airports on the way to catch your flight - vodka and caviar are the highlights. 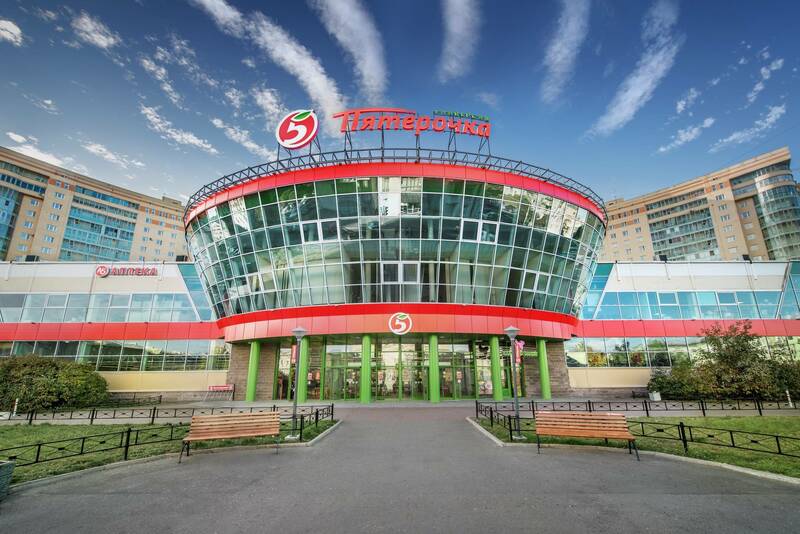 Numerous shopping malls, located within walking distance of Moscow metro stations and in the city center, offera wide range of convenience goods. 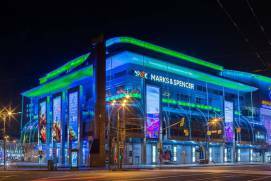 Sales assistantsin major stores and souvenirs shops are often fluent in English. Moscow is not only the administrative, but also the trading capital of Russia. The city is awash with shops and shopping malls of all possible types. Nevertheless, the prices for electronics and clothing in euro equivalent are quite high: the larger share of these goods is produced abroad and therefore is subject to customs duties on import. 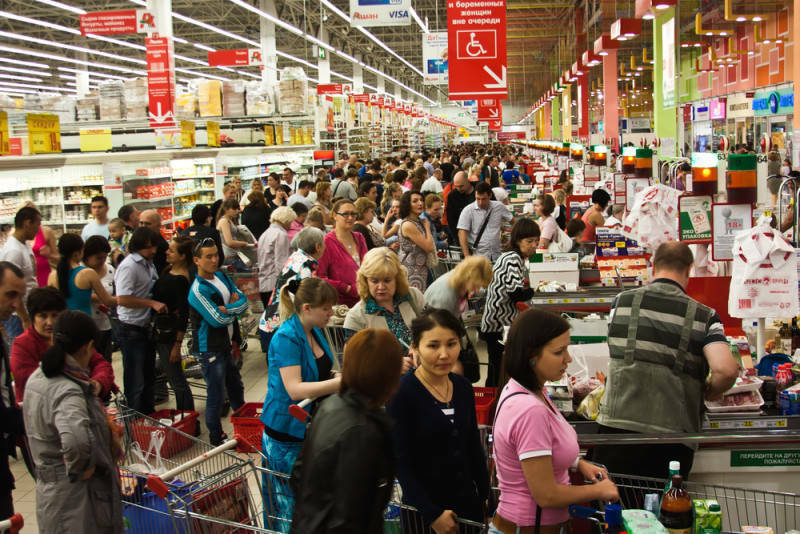 So you shouldn’t think of a trip to Moscow as a chance to save some money on shopping. 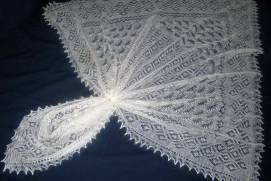 However it does not mean that you will come back empty-handed: there are so many unique souvenirs and things you can buy that will satisfy any taste and preference. 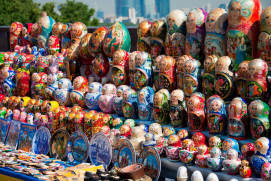 The best-known souvenirs from Russia are matryoshka dolls, ‘ushanka’ fur hats with ear flaps, balalaika (a stringed musical instrument), samovar (a heated metal container with a faucet, traditionally used to boil water), vodka and caviar. A vast selection of gifts is available on the Arbat and at Izmailovo Vernissage market. The easiest way to buy vodka and caviar is in a duty free shop at the airport before your departure, so as not to complicate things for yourself at the customs control or worry about purchasing a counterfeit product. 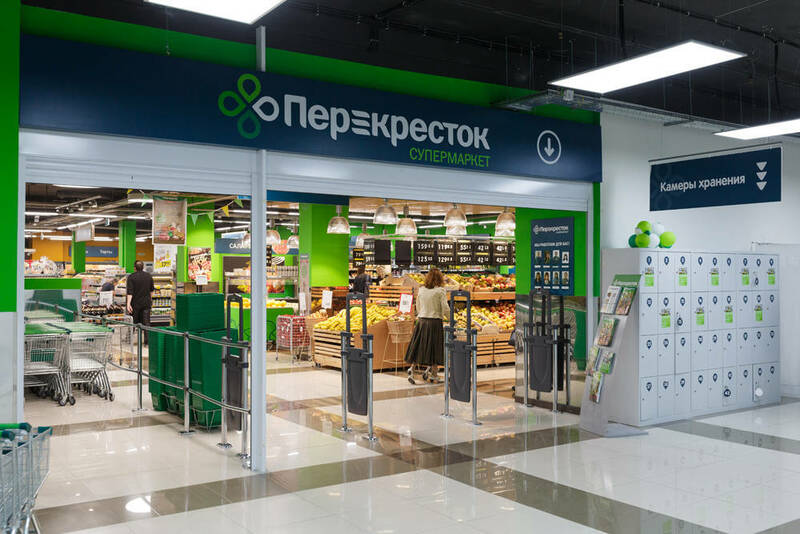 Another alternative is a decent well-known supermarket. We don’t recommend buying vodka and especially caviar in budget stores. And don’t forget about the customs limits! 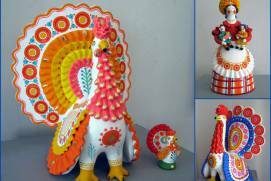 Painting on trays, boxes, miniatures, ceramics, chess: Gzhel, Zhostovo, Khokhloma, and Palekh styles. 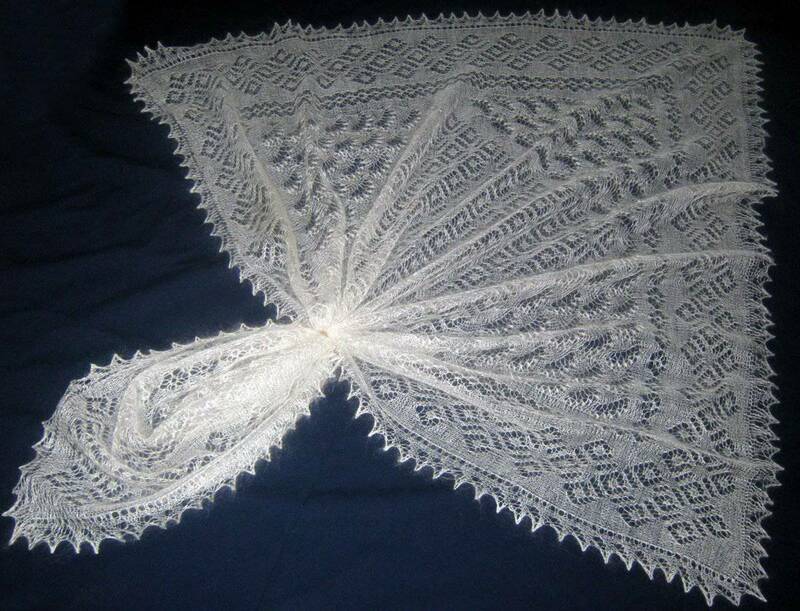 Fabric products: Vologda lace, Orenburg and Pavlovsky Posad shawls. 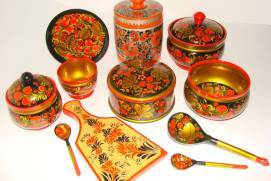 We can also recommend souvenirs associated with the Soviet era. Not the cups and T-shirts made in China with prints like “USSR”, hammer and sickle, etc., but real Russian souvenirs: Russian wristwatches, illustrated books on Russian art, Soviet propaganda posters and socialist realism paintings. 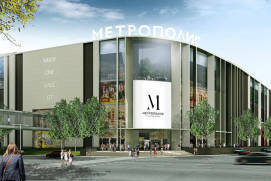 Moscow’s flea market is located in the Izmailovo Vernissage at Partizanskaya metro station. 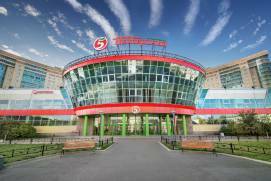 Address: Izmailovskoe highway, 73 ZH (73Ж – in Russian). 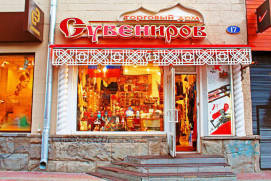 It is open on Saturdays and Sundays from 9.00 to 17.00 and offers a huge choice of traditional Russian and Moscow souvenirs. Long rows of stalls laden with matryoshkas, painted wooden spoons, dolls, and Moscow-themed gifts represent the first half of the famous Izmailovo Vernissage. 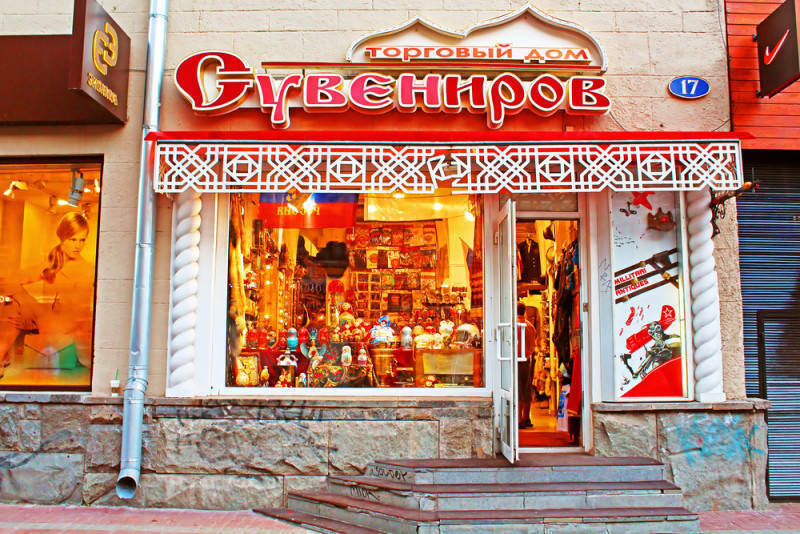 It would be no exaggeration to rank it as the best place for souvenir shopping in Moscow where you can find not only traditional giftsbut also memorabilia and collectibles – coins, military paraphernalia, old musical records, and plenty of other souvenirs. 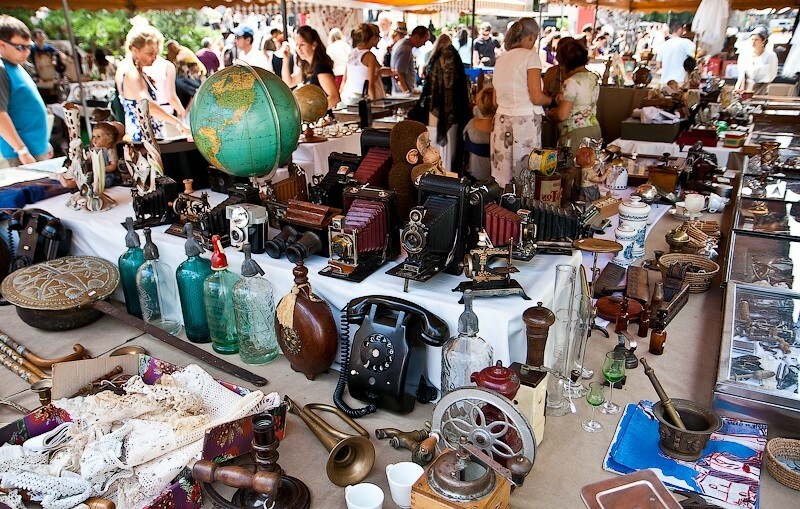 Further on there is a flea market where you can buy genuine antiquities such as bronze pieces, samovars (metal containers traditionally used to heat and boil water), tableware, and icons dating to different epochs. Prices are negotiable; more than that, bargaining is a must. 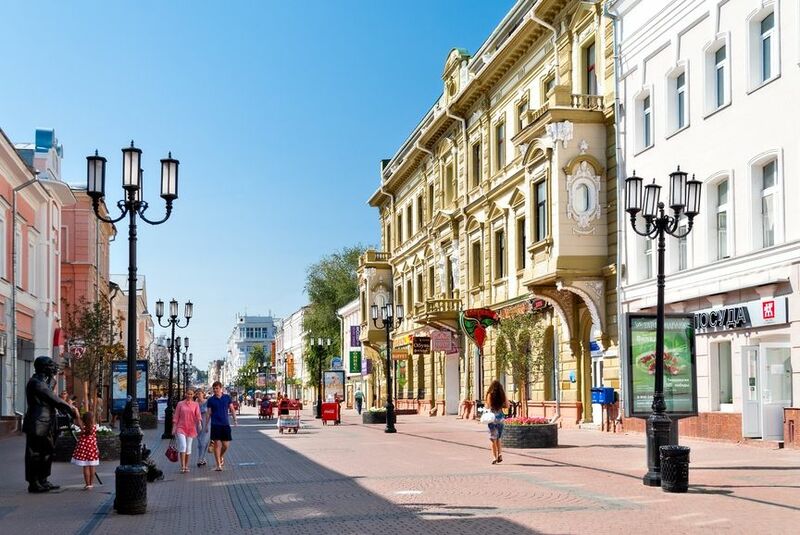 Arbat is a pedestrian street in the inner city mentioned in every Moscow guide. It lies between Arbatskaya and Smolenskaya metro stations. 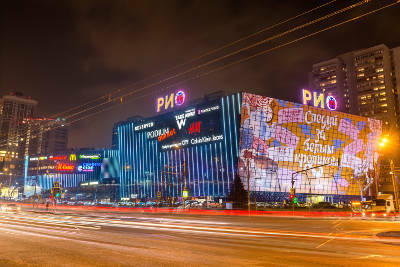 Apart from featuring historic mansions that represent Moscow’s ceremonial architecture of 18th–19th centuries, this street is the main centre of souvenir trade and tourist services: dozens of souvenir shops, jewelry and antique shops, street art exhibitions, as well as numerous cafes, banks and pharmacies can be found here. 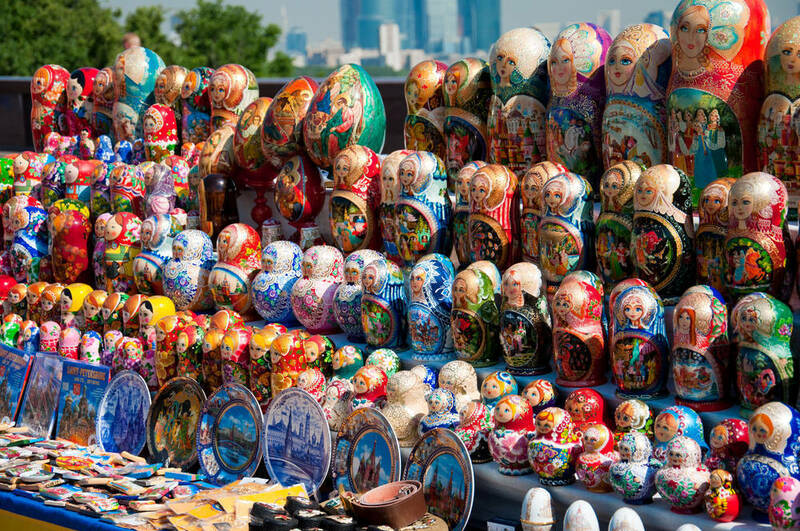 If you’re looking for souvenirs — this would be the best place to go in downtown Moscow. 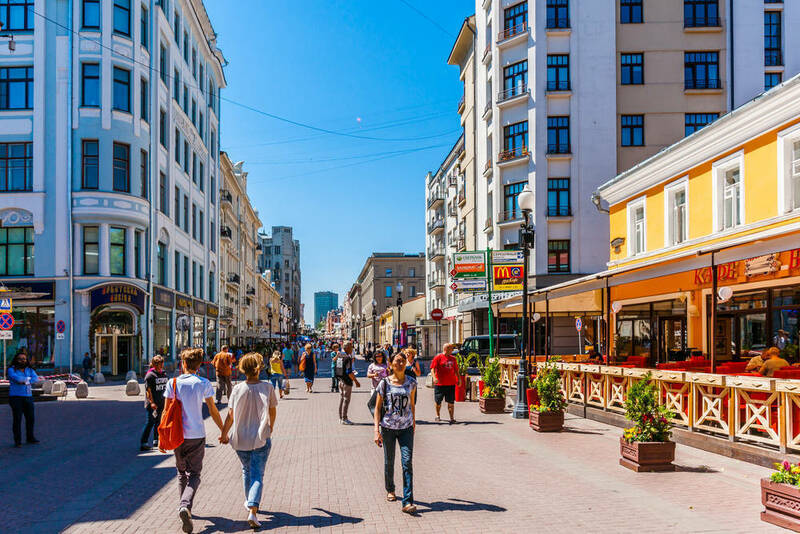 If you consider buying works of art and antiquities and are prepared to deal with customs formalities, visit art galleries and salons instead of the Arbat. 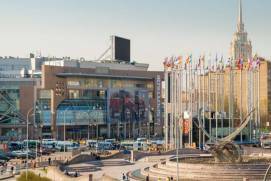 For example, go to the exhibition centre and the vernissage in Central House od Artists on Krymsky Val (Oktyabrskaya metro station). 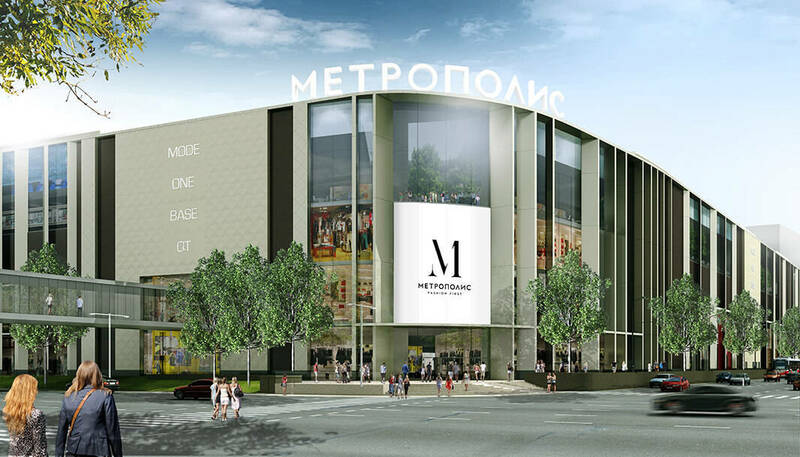 Russians have been among the key buyers of luxury goods in the last decade, so all of the world’s luxury brands — clothes, accessories, watches, jewelry — have their official boutiques in Moscow. 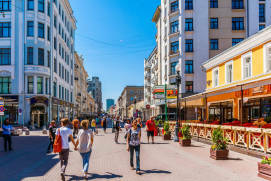 The vast majority of them are located within walking distance from each other in several prestigious neighborhoods in the heart of Moscow, near Kremlin in Moscow. Five-star hotels and Russian government buildings are also located there. 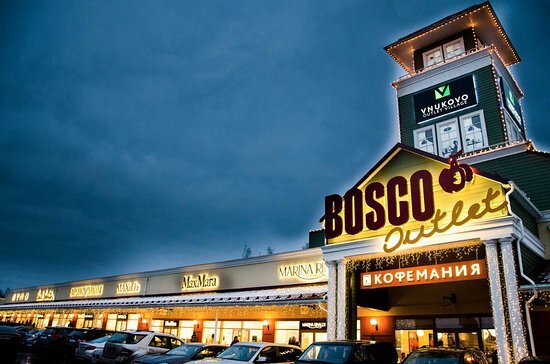 Vnukovo Outlet Village is one of the first and largest outlets in Russia. 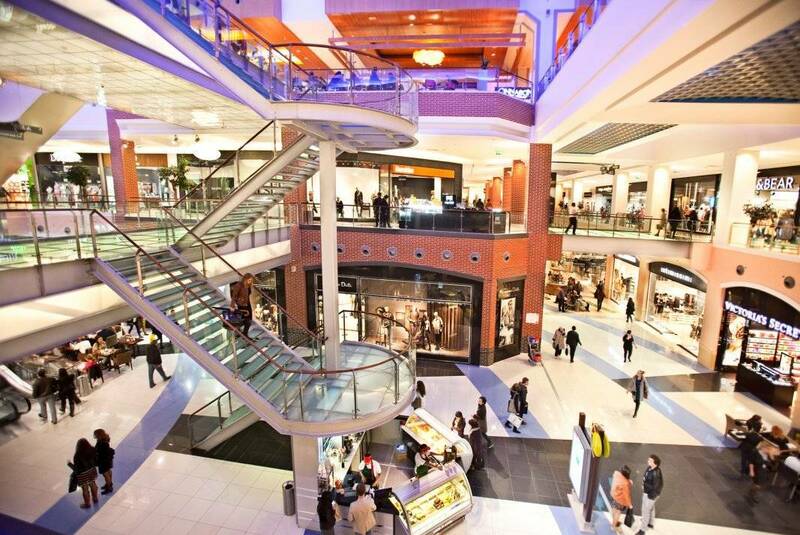 Here you will find boutiques of world famous brands with discounts of up to 70% on collections of past seasons. 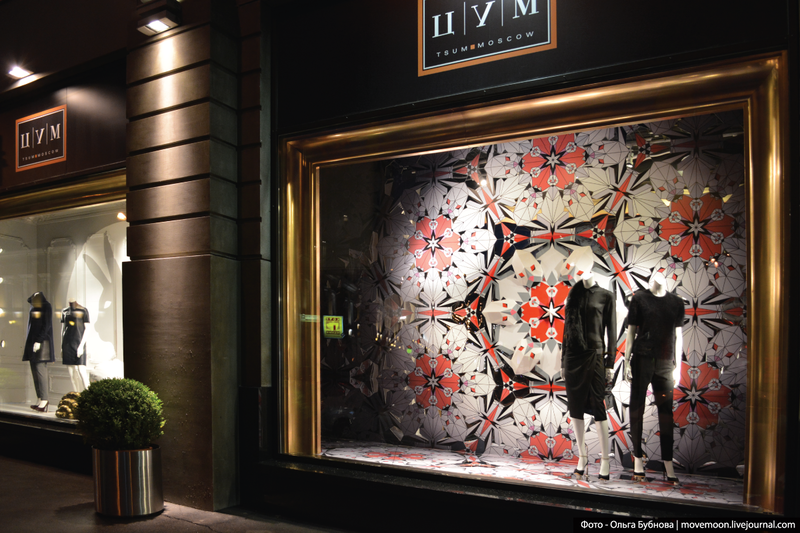 In contrast to the usual sales in mono-brand stores, clothes, shoes, accessories and other products at competitive prices are presented in the outlet all year round, regardless of the season. 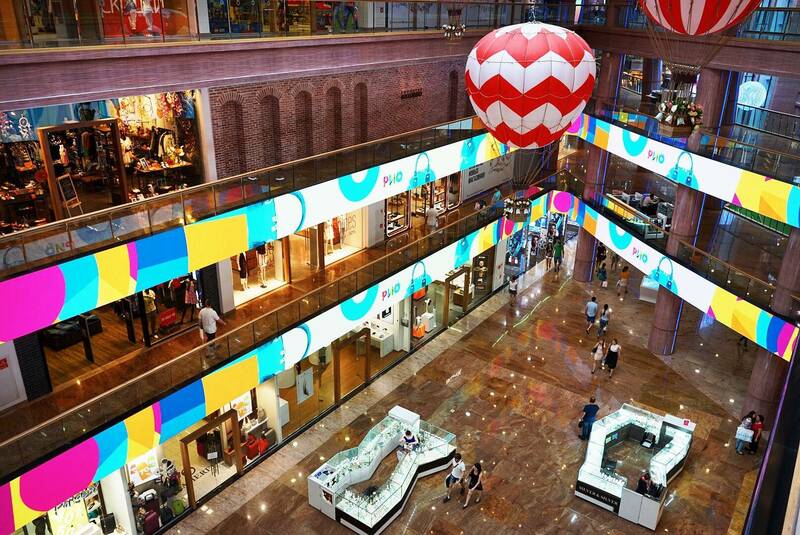 The variety of shops in these malls pretty much guarantees that you’ll find what you’re looking for. 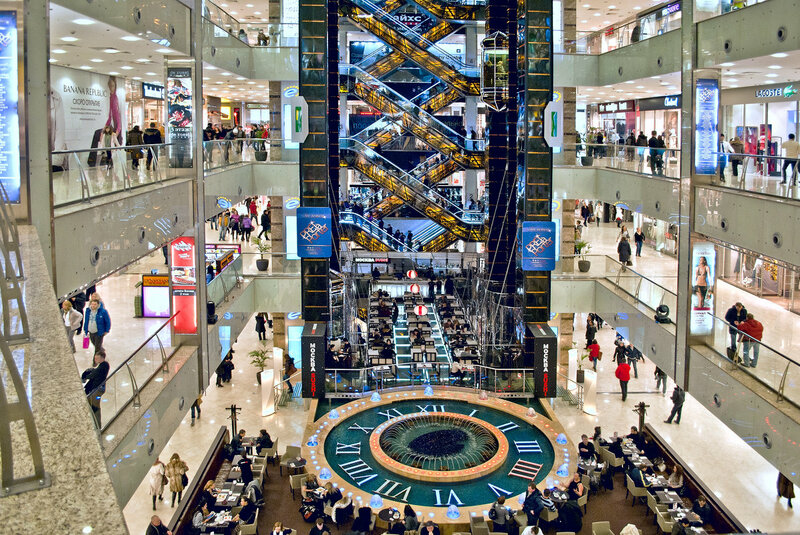 Starting from 2018, you can shop Tax Free at a selection of famous department stores, shopping malls and luxury brands across seven Russian cities including St. Petersburg, Moscow and Sochi. 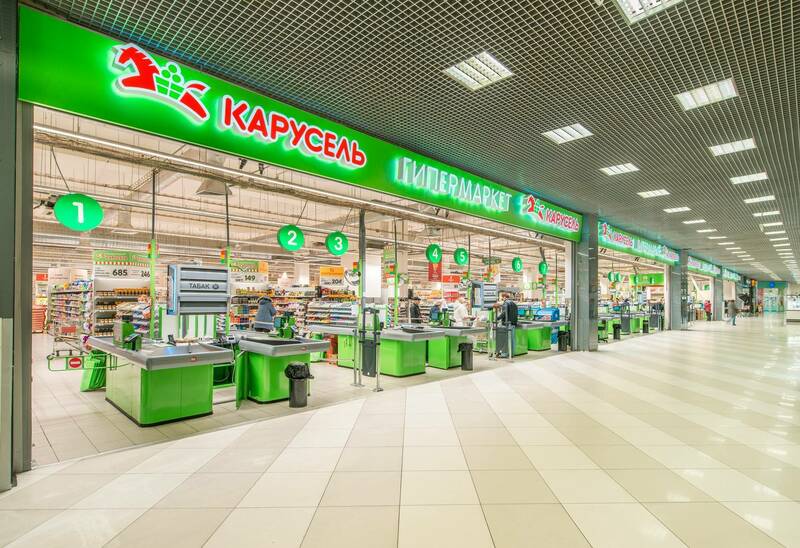 The VAT rate in Russia is 18%, though you will receive in average 10-12% refund. Only international visitors from outside the Eurasian Economic Union (EEU countreis: Armenia, Belarus, Kazakhstan, Kyrgyzstan and Russia.) 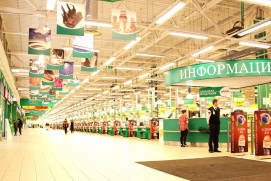 are eligible to reclaim the VAT on their purchases made in Russia. 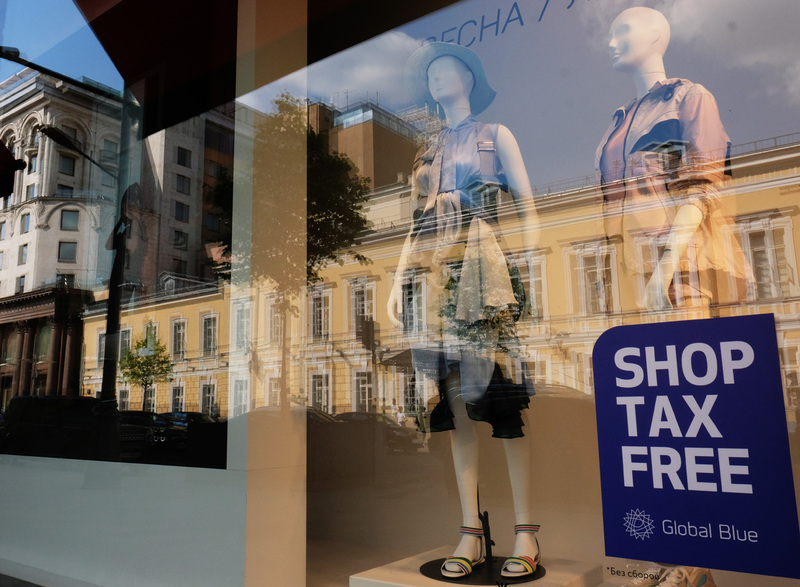 Spend a minimum of RUB 10,000 at shops marked with a special TAX FREE sign. When paying for your purchases, ask store staff for a Tax Free Form. You will be asked to present your Passport. At the airport or port, go to the Customs desk and present your completed Tax Free Form, passport, receipts and unused purchases to get a stamp on your form. 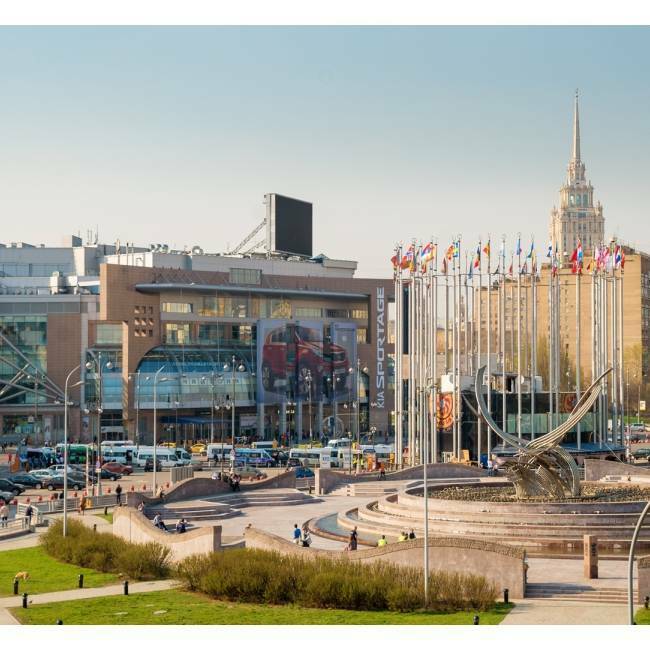 Goods must be exported from the territory of the Russian Federation to outside of the Customs territory of the Eurasian Economic Union within 3 months from the purchase date. Present your stamped, completed Tax Free Form to the nearby desk or office displaying a TAX FREE logo to receive your refund in cash or to your credit card. All chain retail stores are equipped with credit card terminals. Shopping trolleys can be used freely without having to use a coin to unlock them. Customers usually leave any large or heavy bags in lockers at the supermarket entrance (handbags are fine to take with you). In most supermarkets you will have to pack your groceries yourself and pay extra for the plastic bags. 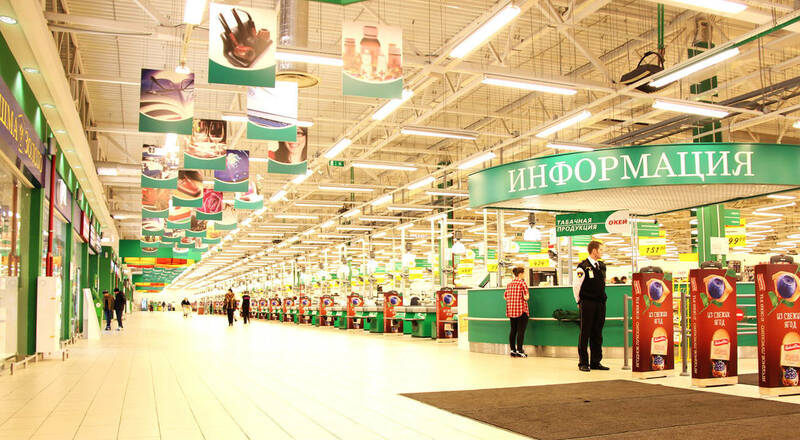 In Moscow, retail stores stop selling alcohol at 23.00 and resume at 8.00. During these hours you can buy it only in bars and restaurants. Tobacco products in supermarkets are sold at the cashier only and cannot be advertised visibly. You have to ask a cashier for the brand of cigarettes you would like. Non-food products can be returned to the store within 2 weeks of making the purchase, as established by law, and as long as you have the receipt. Exceptions include personal hygiene products and medical supplies. 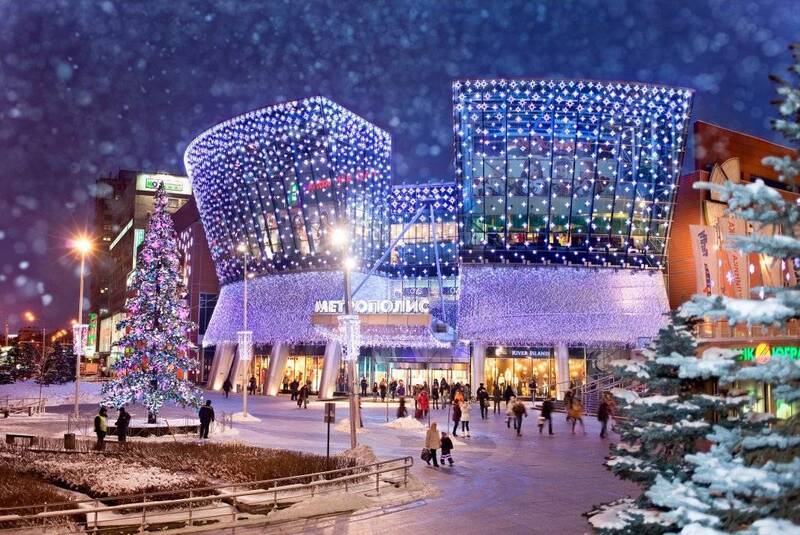 Winter sales in Moscow. Sales start just after the New Year eve and last till the end of January. 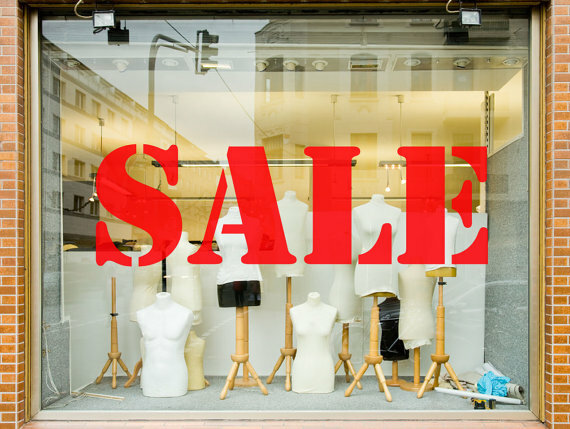 Winter and autumn collections are usually sold with significant discounts in clothing stores. Summer sales in Moscow. They start in July and last till the middle of August. In clothing stores at this time it is worth to buy summer clothes. «Black Friday». 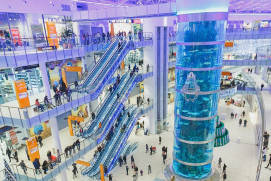 Following the entire world, Moscow joined the sales on the last Friday of November and the following Weekend. At this time, most of the major retail chains and private stores offer substantial discounts on their products. However, beware, real discounts are often not as significant as advertised. Internet and mobile communications. Call rates for mobile phone in Russia are very low. Therefore, if you plan to stay in Russia for a while, it will be cheaper to buy a SIM-card from a local operator: MTS, Beeline, or Megafon. Their products can be found in sales outlets (of a respective brand or in general telecom stores) located near every metro station, airport and railway station. Large chains of restaurants and cafés often provide free Wi-Fi Internet for customers. 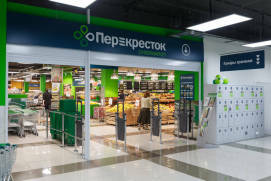 For example, Starbucks, Shokoladnitsa (Шоколадница), Coffe-House (Кофе-Хаус), Mu-Mu (Му–Му), etc. Free Wi-Fi is also available in metro cars and some parks (network registration via SMS is required). Lots of downtown cafés and restaurants on weekdays offer breakfast (till 12.00) and so-called business lunches (from 12.00 till 16.00), even if they don’t advertise them. Normally, it’ll be a great bargain meal for just 300-400 rubles (or for 600-700 in an upscale restaurant) and will make you quite full.